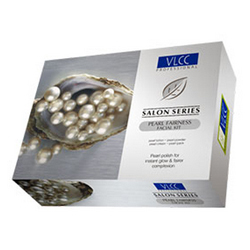 Buy VLCC Pearl Fairness Facial Kit Salon Series. Treatment helps bring an instant glow to the face. This treatment helps in instant tan removal and rejuvenates dull, tired and sluggish skin to bring an instant glow to the face. This is a very popular Parisian facial used by celebrities all around the world. It counters problems related to cellular skin damage and helps build skin's natural defence mechanism. VLCC Pearl Cleansing Lotion is meant for deep cleansing the facial skin. It helps in unclogging pores and prepares the skin for the next steps of the facial. Apply VLCC Pearl Lotion all over the face and neck, massage for 3-4 minutes in circular upward motions and wipe off with moist cotton. Honey, Pearl Oxide, Dimethicone Fenugreek Extract, Sandalwood Extract, Wheatgerm Extract and Turmeric Extract. This cleansing powder is a gentle exfoliator with the goodness of Pearl Oxide and Almond Cake Powder, which helps in exfoliating dead cells, blackheads and dark patches. The skin clarifying actives/enzymes present in the formulation exfoliates dead cells and deep cleanse the skin. Take appropriate quantity of VLCC Pearl Powder mix with milk to make a smooth paste. Apply the paste evenly on face and neck, leave for 1-2 minutes. Using wet finger tips or a moist firmator (if available), massage in circular upward strokes for 1-2 minutes. Wipe with moist cotton. (Double cleanse with VLCC Pearl Lotion as in step 1 to remove the residue of the VLCC Pearl Powder). Zinc Oxide, Almond Cake Powder, Turmeric Extract, Gum Acacia, Sandalwood Extract, Pearl Oxide, Triclosan, and Vitamin E.
VLCC Pearl Cream enriched with Pearl Oxide and sandalwood extract which give this cream the deep nourishing property that rejuvenates dull, tried and sluggish skin. It gives fairness and shine to wheatish complexion. Remove black heads & massage the face with VLCC Pearl Cream. Apply an appropriate amount all over the face and neck, massage for 15-20 minutes in circular motion with upward and outward strokes. Then wipe off using a hot damp towel. Fenugreek Extracts, Bed Nut Extract, Wheatgerm Extract, Turmeric extract, Pearl Oxide, Dimethicone and Vitamin E.
VLCC Pearl Pack incorporates the goodness of Pearl Oxide and Turmeric Extract, making it an excellent pack for skin lightening. It evens out the complexion, imparting fairness and glow that no other facial can promise. Apply VLCC Pearl Pack over the entire face and neck, leave it for 10-15 minutes and then wipe off with moist cotton. Complete the facial by using appropriate VLCC Moisturiser or VLCC Sunscreen according to the skin types. Sunflower Seed Extract, Almond Extract, Turmeric Extract, Gum Acacia Extract, Sandalwood Extract, Pearl Oxide, Zinc Oxide, Dimethicone, Triclosan and Vitamin E..